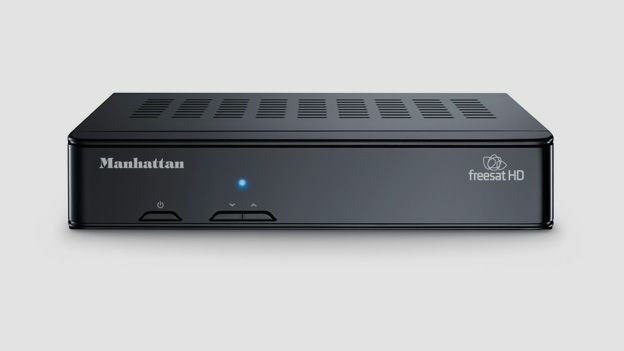 Could the Manhattan Plaza HD-S2 Freesat box be the best TV bargain around? If you're looking to cut the chord with a certain contract pay TV service, then a simple non-PVR set top box could well be a good alternative. The Plaza HD-S2, made by Manhattan, will pay for itself in a couple of months. So what do you get if you opt for this frugal STB? This zapper box certainly won't take up much shelf space. Measuring just 210 x 137 x 41mm, it's barely large enough to accommodate the single LNB input and AV connections. The overall design, crowned by a bright blue LED, might kindly be referred to as workmanlike. It comes with a small, button-strewn remote control. This receiver shouldn't be confused with the Freesat Freetime zapper box, the Humax HB-1000S. While that model sports a fancy roll-back EPG and access to all the main channel catch-up services, this is strictly a first gen product. The main programme guide and genre page are workmanlike, but ease of use is good. The set up procedure is straightforward, requiring you to merely connect your Sky dish, follow onscreen prompts and enter your postcode so that the box can deliver the correct regional channel variations. The Plaza's configuration menus are clean and easy to navigate. Everything you need is here, nothing more or less. There's a single HDMI connector, Ethernet LA port, optical digital audio output (for stereo or Dolby Digital 5.1), legacy Scart (obviously if you use this you'll not get any HD) and a USB socket, used only for software updates not media playback. There's no Wi-Fi onboard. The Freesat channel platter currently offers around 170 TV and radio channels, of which the BBC offerings, ITV One, C4, NHK and Russia Today are in hi-def. Somewhat frustratingly, the channel guide doesn't prompt you to view HD versions of programmes when they're available if you stay into SD guide territory. Ultimately the simplest way to view HD content is to manually assign the HD channels as Favourites. Catch-up is limited to BBC iPlayer and iTV Player. Image quality, specifically hi-def, is excellent. The box may be budget but there's no compromise evident in its picture quality. 1080i programmes are as crisp as a sour cream Pringle, and even the more respectable SD channels don't disappoint. The box also delivers on the audio front, with Dolby Digital 5.1 delivered over the optical digital connection when broadcast. It sounds great when hooked up to an AV receiver. If you're looking for a cost effective way of getting gratis HD TV from a vacant Sky dish, then the Plaza HD-S2 will do the job. It may not be glamorous but it's perfectly usable and performs well enough. However, the Humax Freesat Freetime box may ultimately be the better value. It's obviously more expensive at £99, but offers a full complement of catch-up channels, sports a modern user interface and throws in terrific media playback functionality. However if you just want to squirt telly into a den or bedroom then this Plaza is worth a visit.